There isn’t much that I remember about living in Seoul, South Korea as a little girl. But one memory that lingers after all these years is how the streets were perfumed with the scent of roasted sweet potatoes in the winter. I don’t know how it is now, but back then the streets were filled with carts that sold perfectly roasted sweet potatoes. Roasted Korean sweet potatoes are very different from their American counterpart. They are insanely sweet and the flavor is chestnut-like. And unlike American sweet potatoes, they don’t get watery. Instead, they are more fibrous and hold their shape when peeled. For many years, I’ve tried to recapture that memory by roasting Korean sweet potatoes in my oven. The smell was spot on, but I couldn’t get that same roasted taste that I remembered. There is a Korean market that I stop by for snacks when I’m at my local Laundromat. If you stop by in the colder months, there is a small machine that churns out roasted sweet potatoes and the whole store smells has that warm roasty toasty smell. Anyways, after having one that was properly roasted, I became obsessed with trying to recreate it at home and scoured the internet on how to do it. I finally came upon a blog that featured this pot and after finding it in a Korean supermarket (It’s so much cheaper. I got it for less than $20 because it was on sale), I gave it a try and I finally reached sweet potato nirvana. Tip: The instructions say to roast on medium heat for 20-30 minutes but I found that roasting for about an hour on low heat produces the best results. Armed with my new roasting pot, I wanted to feature sweet potatoes differently and made these macarons. Purple sweet potatoes are just as sweet but not as flavorful as their yellow cousins. However, I couldn’t resist their beautiful purple flesh. I suppose I could’ve made the frosting a vibrant purple by adding a little food dye, but I wanted you to be able to see what it would look like without it. The best part about the frosting is that it takes just one stick of butter and about ¾ cup of powdered sugar (which just might be perfect for filling cakes for babies since you are using minimal sugar). Can you tell that I originally made these for Valentine’s Day? The purple ombre effect is easy to achieve by using an edible food color spray can. They’re easy enough to find on amazon. 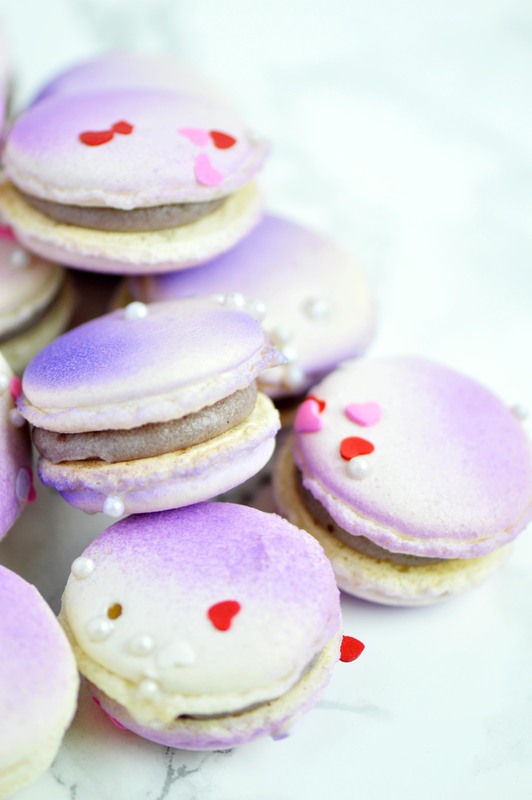 You want to be careful to be light handed or you will end up spraying the entire macaron purple. This is especially true if your spray can is new. 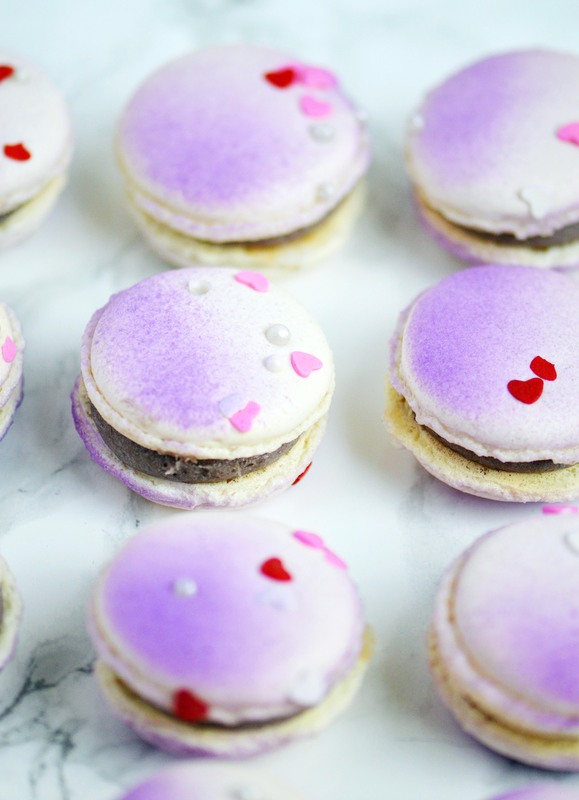 There are so many options out there, I feel like you have a rainbow at your fingertips and it’s an easy way to spruce up a plain macaron. Even if you don’t decorate it, they’re definitely worth giving a try and best eaten within two days. Since the frosting has low butter/sugar content, it will turn your macarons soggy as the days go by. Mix ⅓ of the egg white mix to the almond mixture and stir together until the batter is slightly lighter and less pasty. From then on, fold in ⅓ of the egg white mixture twice until the mixture “flows like magma”. The mixture should be smooth and run thick ribbons off the spatula. Fill batter in a pastry bag fitted with a ½ in. plain tip. The piped batter may have peaks but should smooth away in a minute or two. 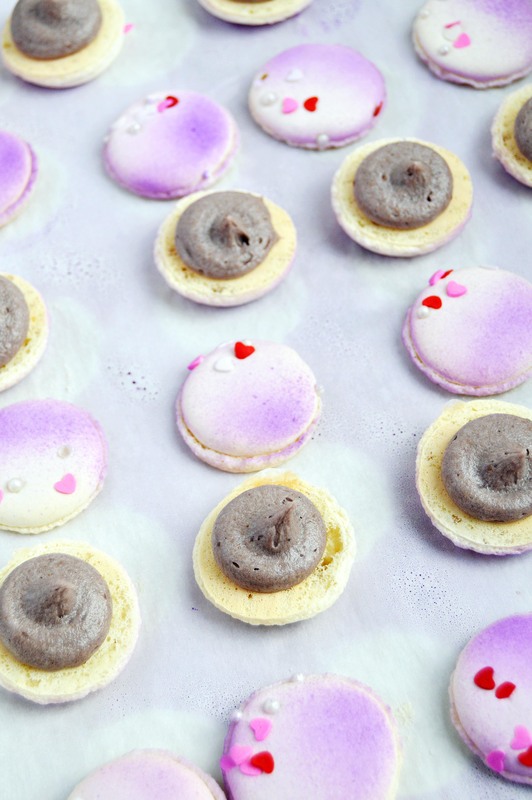 Sprinkle the top of the macaron batter with the pearl and heart sprinkles. Let the batter stand until the tops of the macaron batter are dry to the touch, about 30 mins to 1 hour. Once you place the macarons in the oven, reduce the heat to 300˚F. Bake 10-13 minutes, until the feet are formed and the tops are smooth. The macarons are done when you slightly wiggle them and they start to come off of the parchment paper / silicone mat. 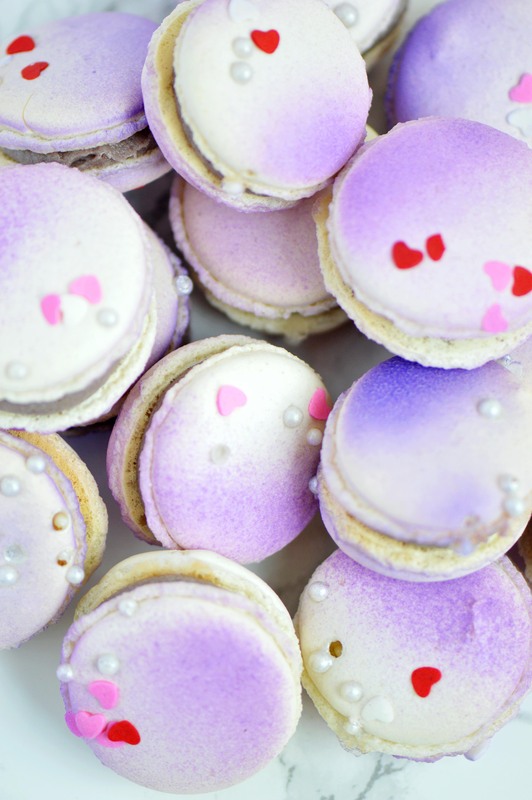 Once you remove the macarons, reheat the oven to 350˚F for ten minutes before baking another pan of macarons at 300˚F. Once the shells are cool, spray one side of the macarons lightly about 7 inches away from the surface. Fill with frosting. Peel the outer skin of the sweet potatoes and put them the food processor. Puree the sweet potatoes until very smooth and silky. Set aside. In a bowl of a standing mixer fitted with the whisk attachment, whip the butter until light and fluffy. Add in ¾ c. of the powdered sugar and the sweet potato puree and whip until a smooth frosting forms. If not sweet enough, add the remaining ¼ c. powdered sugar and whip until smooth. Fill the macarons. 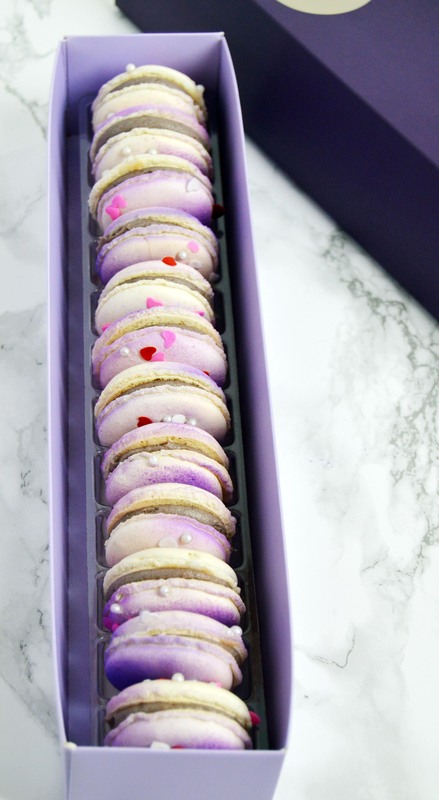 This entry was posted in Cookies, Desserts, Holidays, Macarons, valentines day, Vanilla, Vegetables and tagged Cookies, dessert, Desserts, Holidays, macaron, Macarons, purple, sweet potato, valentines day. Bookmark the permalink. These are beautifuuuul Giselle, v-day or not, they are gorgeous! Food associated with memories is always the best kind and what a GENIUS idea using sweet potatoes, brilliant! How many macarons will I get with this recipe?